One mother has been caught on camera pulling a gun on a group of kids in a park, who were bullying her son. Tracy Lesser, 42, took the gun to the park in St Louis after getting a text from her son asking for protection, according to reports. Her husband was also pictured in the background, carrying a baseball bat, and the story has predictably horrified people. She claims that she ‘absolutely did not’ intend to use the gun. 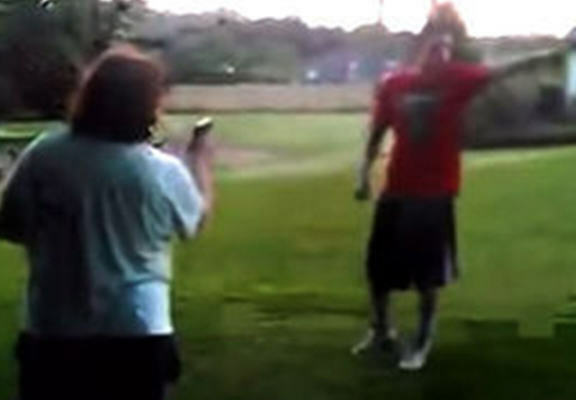 The video was taken on August 26th, and came days after Don Lesser chased the alleged bullies down the street with a pocket knife after he caught them having a fight outside his home. The violence has shown no sign of stopping, after reports of BB pellets being fired into the window of the Lesser’s house surfaced over the weekend.